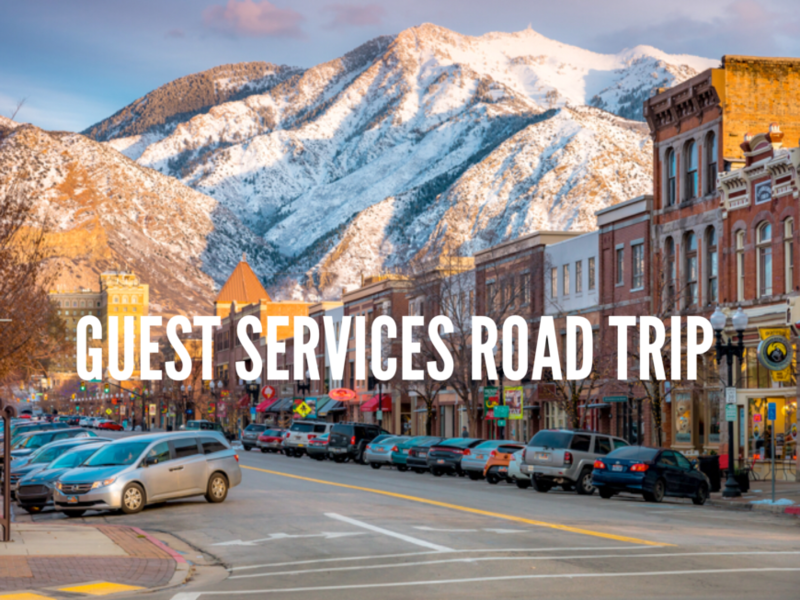 Each month, we revisit a series of posts called Guest Services Road Trip. We’ll travel the country from the comforts of our couches, interviewing leaders who are in the trenches of ministry. Do you have an idea for GSRT destination? Have a leader I need to talk to? Want the inside scoop on churches that seem to be doing this hospitality thing really well? Let’s talk. Angie Mood is the Guest Services and Connection Director at Washington Heights Church, a church of 1,600 people in beautiful Ogden, Utah. WHC exists to help people meet and follow Jesus. They do this by loving God, loving people through small groups, serving their community, nation, and world, and by encouraging their congregation to invite their friends. Angie has been a part of the WHC team for nine years and leads their Guest Services Team on a weekly basis. You can contact her via email. What are the top three books you’ve read on the topic of guest services and/or volunteerism? What does your training process look like for your guest services volunteers? We currently use Safe Hive to provide a customized, initial training for our Guest Services team members. New team members are generally paired with an experienced team member for some “on the job” training as well. When the need arises, we have hosted “in person” training for the team but we do work hard to avoid adding to our already busy volunteer’s calendars. We have a private Facebook Group where I can share pertinent information and opportunities to read further about Guest Services related topics. How is your Guest Services Team structured (org chart, leadership pipeline, etc.)? Do you ever release Guest Services volunteers to lead in other ministries? As Director, I am a full-time church staff member. I oversee teams of greeters, first time guest concierges, our Information Center, auditorium hosts, hospitality, parking attendants, and the security team. (It’s more of an org chart type of leadership.) Most of those teams have leaders who are the primary contact point on Sundays. Indeed, we seem to be a great “training ground” for releasing people to take on leadership positions in other areas of ministry. That said, there has been an intentional effort to communicate among our leadership team so that we don’t hinder another’s team with a possible addition to our own team. Talk about your assimilation process. What specific steps do you have to move someone from first time guest to follower of Jesus? A Connection Card or children’s check-in is generally our first contact with a guest. From there we engage them with a series of emails and a handwritten card which includes a gift card to our coffee shop. We encourage guests to attend Starting Point, join a Small Group, or join a serving team as a first step to get connected. For us, moving toward becoming a follower of Jesus takes more than one route. For some it is a straight line and for others it is more of a meandering path. Part of what we measure (is that a bad word?!) is guest retention, basically, whether a guest has made any steps toward making Washington Heights Church their home. That keeps our guests “in view” as we look back to measure how we are doing. It can become cumbersome with a lot of guests, but I am empowered by our leadership to make this a priority because it is a priority for them. I work closely with the Small Groups Team to help people make connections that lead them toward meeting and following Jesus. Fellowship One provides a great “pipeline” for all the contacts we get on a Sunday and helps me to manage each one. What is one of your best practices / ministry hacks that you’re especially happy with? I really do love our online training through Safe Hive. It helps me to provide new volunteers with a lot of details, at a time convenient to them, before they begin helping. It saves me a ton of time because I don’t have to communicate how we schedule, what the expectations are, or emergency procedures. It gives the volunteer a nice foundation from which to begin. What is a challenge you’re currently facing on your Guest Services Team? A struggle for me has been to develop a consistent parking lot team. Some of that has to do with the weather in northern Utah. That said, we continue to cast vision and have not given up. I’m looking forward to warmer weather and a chance to extend more of our Guest Services presence outdoors. I feel like once people catch the vision I think we can keep them coming, even if they have to wear their ski suits to church to keep warm out there! See all posts in the Guest Services Road Trip series. Disclaimer: FTC watchdogs want me to tell you that if you order a resource from a link on this page, I may receive a small affiliate commission from Amazon. If that bugs you, feel free to bypass my link and buy from a vendor of your choice. But still: buy it. I only promote items that have benefitted me and that I believe will benefit you.